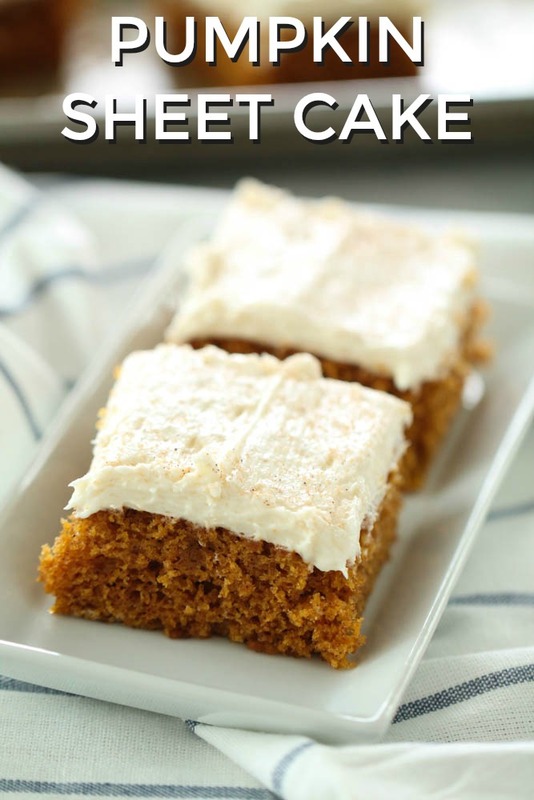 Light and fluffy homemade Pumpkin Sheet Cake with delicious cream cheese frosting. This tasty cake can feed a crowd and everyone always loves it! This pumpkin dessert is perfect for Thanksgiving. We have teamed up with our friends from Kroger to bring you a little taste of the holidays. I don’t think I will ever get sick of pumpkin. I could honestly eat pumpkin desserts any time of the year and be content with life. So that is where this magical creation began. 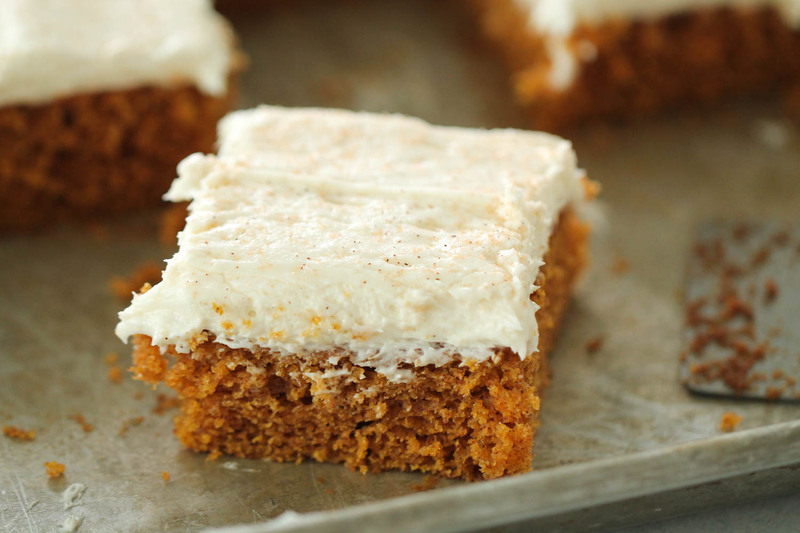 This Pumpkin Sheet Cake is way easier to make than pie and can feed a crowd! We make this recipe in a half sheet pan. It wasn’t until a few weeks ago that I realized that there are so many different lengths and sizes of sheet pan. This recipe will work with any cookie sheet that is 15×10″ or larger. For this recipe I made it in an 18×13″ sheet. Either will work, they will just have a different thickness to them. Step 1: Preheat oven to 350 degrees and spray a baking sheet with nonstick cooking spray. Step 2: In a mixing bowl, combine the eggs, sugar vegetable oil, and pumpkin puree. Mix until fully incorporated. I used a whisk but you could use a stand or hand mixer. Step 3: Slowly add the flour to the wet mixture. Continue stirring as you do so. This will help with the lumps. Keep mixing until the mixture is smooth and fully combined. Step 4: Add the cinnamon, pumpkin pie spice, baking powder, baking soda and salt until everything is well combined. Step 5: Pour the batter into the prepared baking sheet, and spread it out evenly on the pan. Step 6: Place in the oven and bake for 25-30 minutes, or until an inserted toothpick comes out clean. Step 7: Take out of the oven and let cool completely. Step 8: In a bowl, cream together butter and cream cheese until smooth and fluffy. The butter should be softened, but not melted. Room temperature is preferred. Step 9: Add the vanilla extract and powdered sugar and mix util well combined. Step 10: Spread frosting over the bars and garnish the a dash of cinnamon. Thanksgiving morning is probably one of the most stressful mornings. It’s hard to rotate different dishes in and out of the oven. 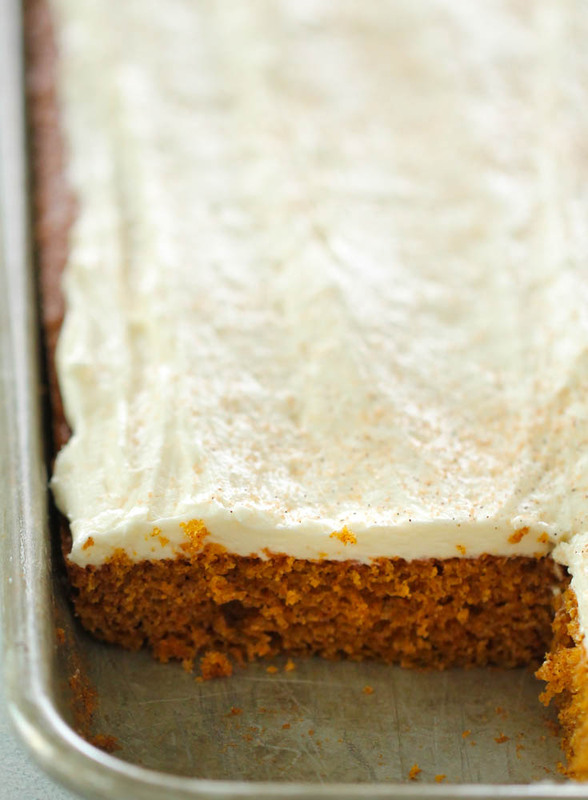 However, with this Pumpkin Sheet Cake, you can make it the day before. We do recommend refrigerating it until serving, or at least overnight if you are making it ahead of time. It has cream cheese frosting, so to avoid that melting or softening too much, we have found it tastes best when it is cold. Refrigerating it will also keep it from drying out. Be sure to cover it with foil or a lid, and place in the fridge until ready to eat. 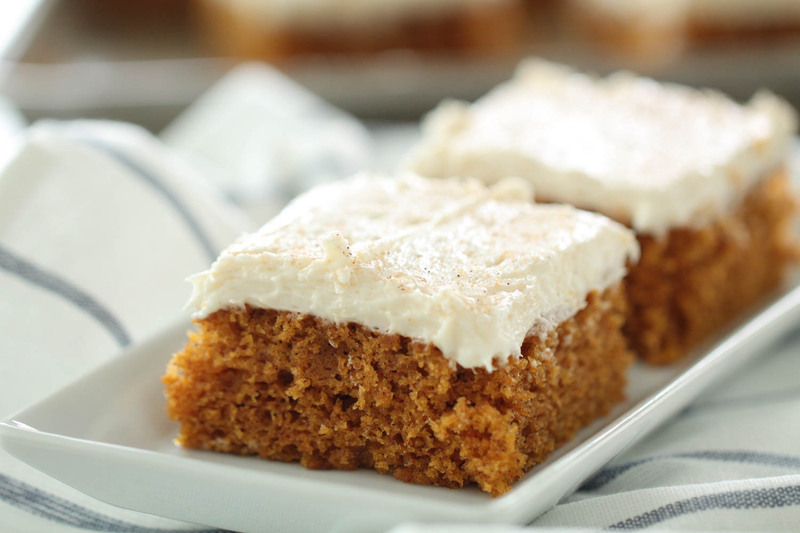 Light and fluffy homemade pumpkin cake topped with delicious cream cheese frosting. Spray a half baking sheet with nonstick cooking spray. In a mixing bowl, combine eggs, sugar, vegetable oil, and pumpkin puree until fully incorporated. Slowly add the flour but continue stirring to avoid lumps. Mix until well combined. Add the cinnamon, pumpkin pie spice, baking powder, baking soda and salt and mix until well combined. Pour the batter into prepared baking sheet and spread in an even layer. Bake for 25-30 minutes, or until set and let cool completely. For the frosting, cream together butter and cream cheese in a mixing bowl until fluffy. Add vanilla and powdered sugar and mix until smooth. Spread frosting over the cake and sprinkle cinnamon on top, if desired. If you love this Pumpkin Sheet Cake, you will love our Easy Pumpkin Pie recipe! I recently made the pumpkin sheet cake over the weekend and it was a huge success. We all loved it and the cake was so moist. Will definitely be making this again!! What size cookie sheet? I make another sheet cake recipe in my 15 X 10 cookie sheet. Would that work? Hi Kathi, I just measured our pan and we used an 18 x 13 inch pan. Should this be stored in the fridge? Could this be made a day early? This can be made a day ahead. You could store it in the fridge or in a cool place. Be sure to keep it covered.